Note: This article was originally published in Technician on January 13, 2006. Struggling underdog team? Check. New coach? Check. Intense sports showdowns? Check. Racial discrimination? Check. Budding romance? Check. 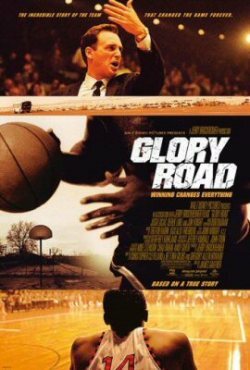 In its latest flick, Glory Road, Disney uses all those cliches and more in its quest to make yet another true-story sports movie about a team triumphing over obstacles that will make you feel warm and fuzzy enough to spend your money on it. The film follows Texas Western coach Don Haskins in 1966 as he takes the first all-black starting lineup to the NCAA championship. Think Remember the Titans, but with college basketball, and not as good. Indeed, the film seems content to steal situations and characters from every other sports movie in recent memory, as if combining them together will somehow make the story even more dramatic. There are unresolved subplots lifted from everything from Coach Carter to Finding Forrester. As a result, the characters are flat and the plot feels old and tired. And you know what? It is. When was the last time you saw a sports movie that wasn't about a team that "changed everything" in one way or another? You can forget about becoming engaged with the characters. The writer seems to have been too busy scribbling witty banter between characters (one of the film's bright spots) to take the time to focus on the big picture. As a result, characterization threads are started but never explored to a point where they might actually become engaging. Unoriginality aside, the film does have a few things that save it from being a total waste of time. Josh Lucas delivers a solid performance as Haskins, despite the character's lack of dimension. And in terms of a movie about basketball, the sport doesn't get much more fun than this. The game itself emerges as a central character, and the editing makes it feel as if you're right there on the court with them. You'll want to clap and cheer whenever there's a good play, even if you don't know anything about the character who did it. This movie at least feels like it's trying to do something amazing. It's not terrible, just mediocre. If you're in the mood for some mindless basketball fun, you might want to consider dropping a few bucks to see it. Just don't expect to see anything you haven't seen before in better films.